Celebrating Manchester by bringing the community together! We are organising a charity event to raise money for 'Forever Manchester', a charity that raises money to fund and support community activity across Greater Manchester. In order to raise as much money as possible for this incredible charity, we’re looking for donations to support the costs of putting on this event. 'Forever Manchester' supports a diverse range of projects that help young people, older people and disabled people; they also look at homelessness, sports education, cancer support projects and much more. We chose this charity as we are incredibly proud of the city we live in and wanted to help put money directly back into the community around us. We hope to raise around £600 with our event but really hope we can go above and beyond this on the day. 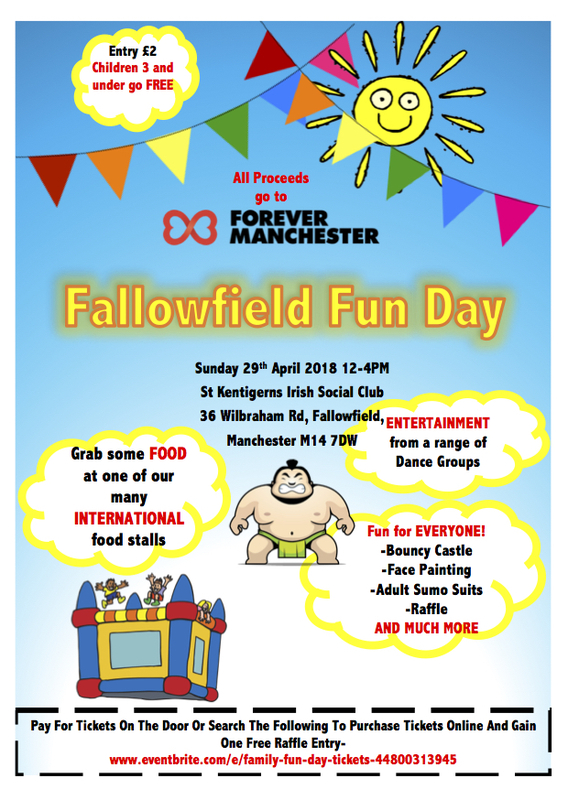 We have created the programme for a Fun Day in Fallowfield that anyone and everyone can enjoy. We hope to get as diverse a group of attendees as possible! Being a donor to this campaign will help us create a successful event for everyone to enjoy and to bring the community together. Manchester has been through a lot in the past year but has shown that the people who live here are extremely strong and come together in any time of need. We want to create a day of fun and entertainment for everyone. Please give to show you care about this incredible city and if you have been unsure how to give back in the past this is the perfect way to show your support for others. Money donated to this campaign will be a donation to The University of Manchester (exempt charity number XR82062), to pay for the materials we need to put on this event. If we get any extra funds this will go directly into making the event bigger and better - we could buy more games to have on the day. We will give updates every couple of days to say how many tickets we've sold or if we've secured another form of entertainment on the day. We would love to give out 'Forever Manchester' merchandise and Manchester themed rewards to anyone that donates or sponsors us. Keep up to date with our event here!! We also really need prizes for our raffle on the day - please contact firsteventsuom@gmail.com if you could donate a prize. And we know we said you don't need to give money to help us, but we'd love it if you did! Please help put on this event for the whole community - we'd love it if you came along on the day as well! Social High Five - We'll thank you on our Facebook page. A Manchester tote bag designed exclusively for Forever Manchester by award winning designer Si Scott, using his inimitable creative font style. A Forever Manchester T-Shirt which takes inspiration from the 'Manchester Bee' together with the words 'Forever Manchester' and heart-shaped infinity symbol. Designed exclusively for Forever Manchester by award winning designer Si Scott. This T-Shirt was worn by Manchester Poet Tony Walsh at the 'One Love Manchester' benefit concert for the victims of the Manchester attack on 22nd May 2017, where he delivered his inspirational 'This is the Place' Poem, originally commissioned by Forever Manchester.